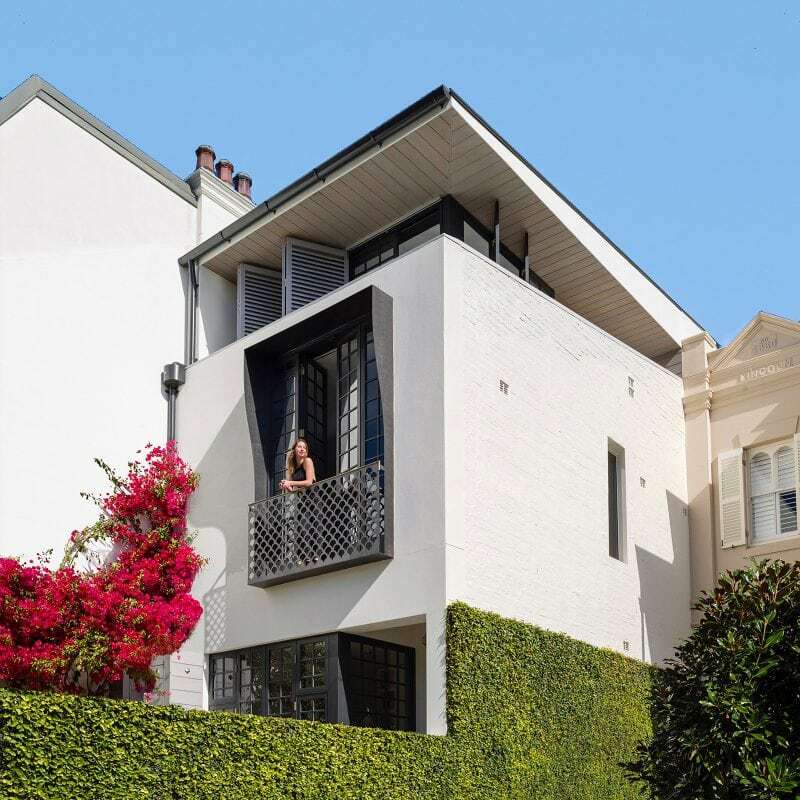 Sydney’s planners are considering the return of the terraced house, or row house, as a favoured residential building type. It is believed the terrace could be one solution to addressing housing affordability; by allowing the subdivision of standard quarter acre blocks of land into narrow strips and building adjoining two-three storey dwellings. 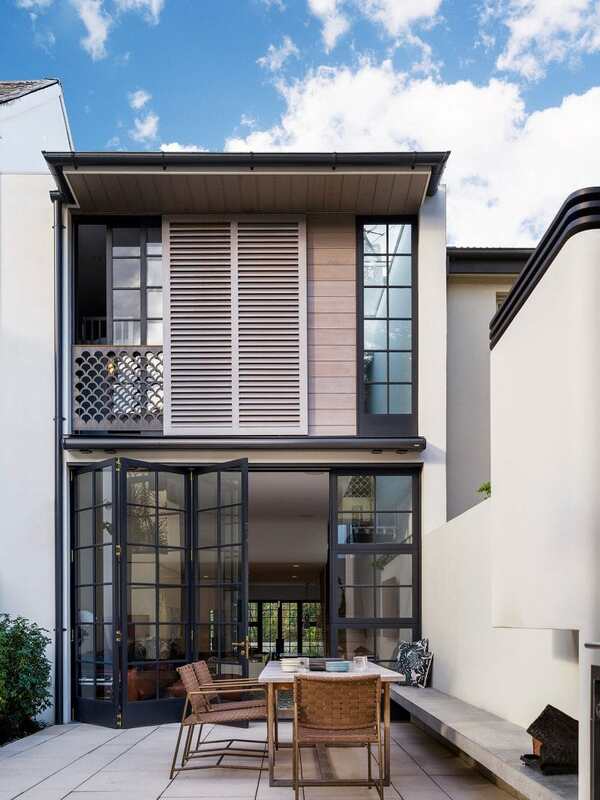 This Woollahra terrace demonstrates that, even on a small site, you can fit a home with three bedrooms, three bathrooms, a guest flat, a garage, and an open-plan living, dining, kitchen suite, without missing out on a study, dressing room, laundry, balcony, lightwells and two wonderful courtyards. 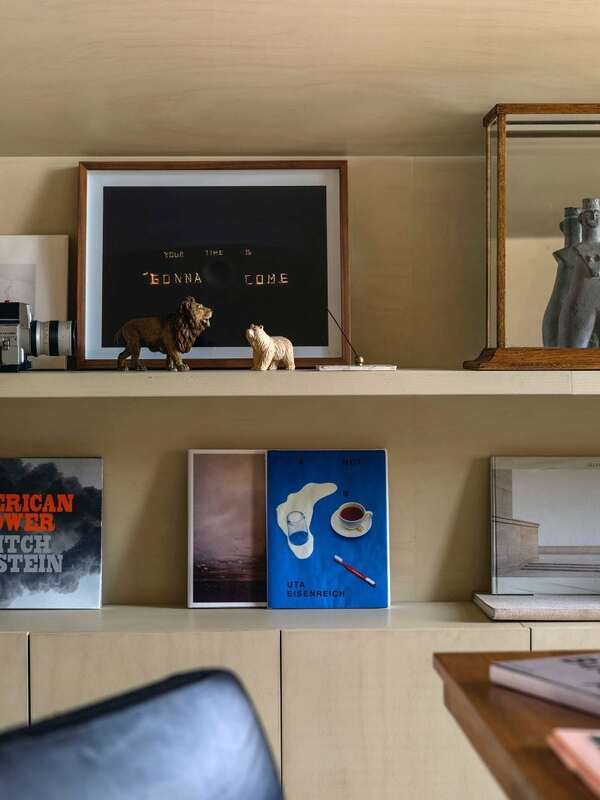 An economy of space forced the architects to think clever and employ efficient solutions to home planning. 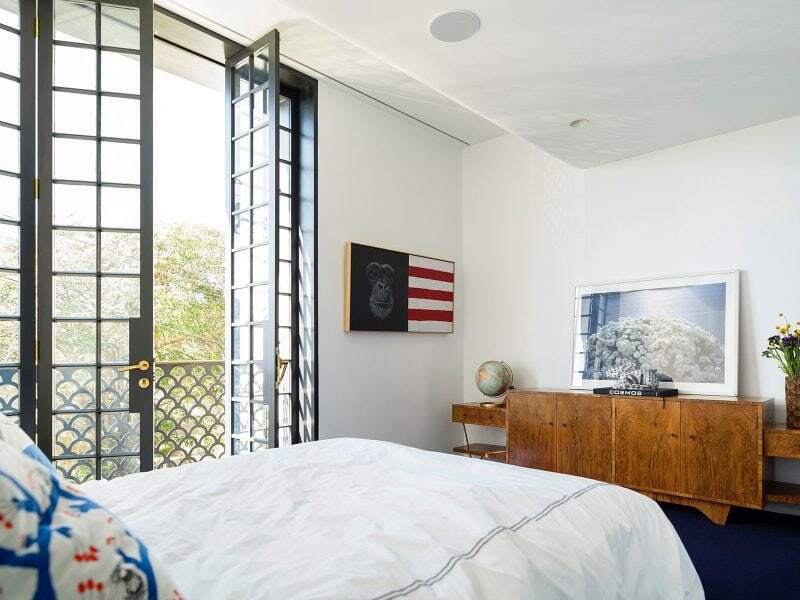 The Adolf Loos concept of “Raumplan” was the inspiration, with the interlocking of each room, Tetris style, within the strict wall boundaries and council restrictions. Split levels between the front and the back help the adaptation to the site slope and to shorten the stair flights, three storeys have been compacted to the front of the house and two taller storeys containing a living room and the lightwell sit to the rear. 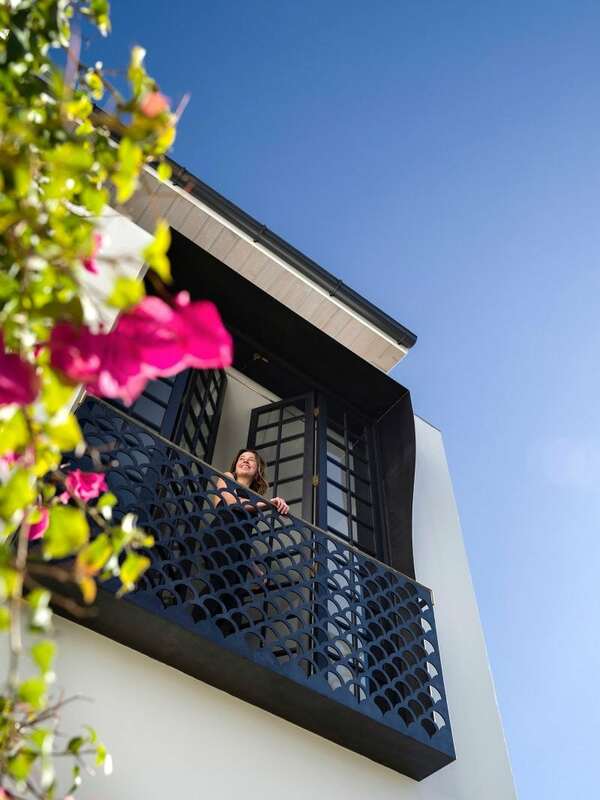 Elevated above the street, the entry courtyard is dominated by an established bougainvillea plant and overlooked by a balconet or “Juliet Balcony”. It is a sunny northerly terrace ideal for a midwinter Campari & Soda. Between the main house and the studio / garage at the back is a second courtyard where weather permitting, the family gravitate to enjoy an open space for the children to play, and to savour the fruits of the olive tree and the barbeque, and the warmth of the outdoor wood burning fireplace. 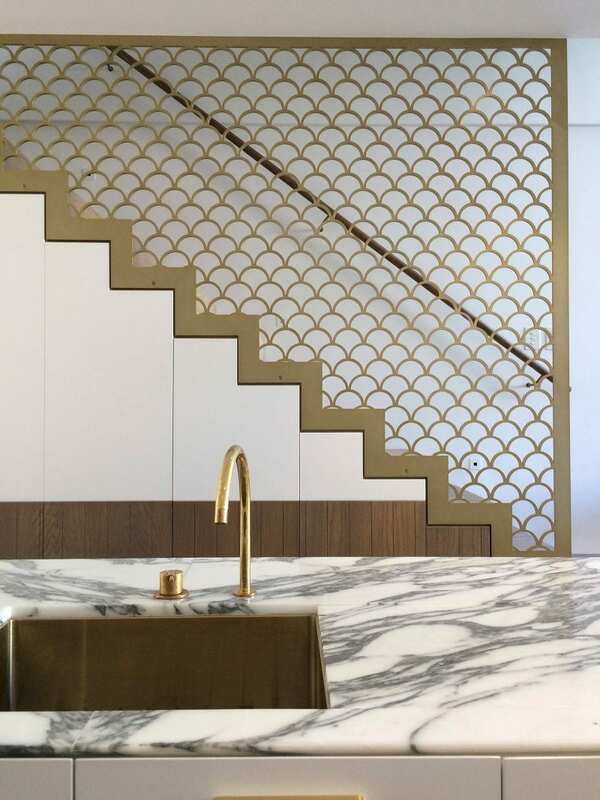 Designing for a film director requires good planning and engaging imagery, the stair balustrade with fish scale brass screen is not a standard balustrade by any means. The powder room inserted under the stair is a voluptuous space that feels nothing like an aircraft WC, despite its dimensions being smaller. The dining seat takes inspiration from the Michelin Man and Irish furniture designer, Eileen Gray. An oversized, 3.5m tall window framed with a Juliet balcony at its base and a steel hood are the protagonists of the street front performance, they provide a visual conversation with the passers-by. 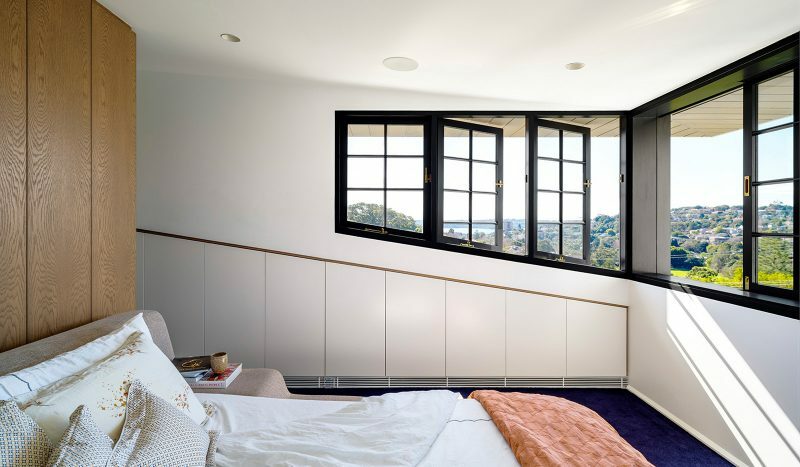 The upper level of the master bedroom has a recessed panoramic window to contemplate the ample views of Sydney Harbour and Bellevue Hill across the valley. Black and white thrives in the strawberry (hot) pink of the bougainvillea bloom. The film director can throw open the French doors in the early morning, step out onto the balcony and call out his daily instructions to the passing birds and bees on the flowers. The cast iron lacework of the Victorian terrace house was the first of the 19th century technological advancements in casting and iron foundary processes and techniques. CNC routed steel plates are the modern equivalent and the fish scale pattern is the only link between the two centuries. Luigi Rosselli Architects found the same pattern in Karl Friedrich Schinkel’s palace in Sanssouci Park, Potsdam. The front gate and Juliet balcony balustrade, both cut from steel plate, bridge the centuries in the same way as this row house bridges with the venerable adjoining older houses. 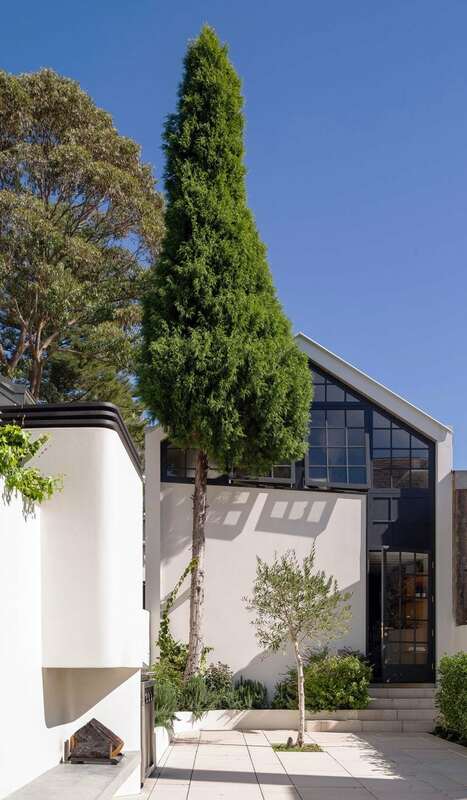 From the internal courtyard the façade architecture is a practical placement of timber windows and shutters. The small scale elements, such as the shutter blades, the fish scale balustrade and the small window panes are intentionally placed to provide a fine texture of materials and patterns to break up the large scale and give a feeling of security. On the opposite side of the courtyard, an old garage has been rebuilt and one can still see the raked garage roof shape at the bottom of the attic studio that was added over the garage. 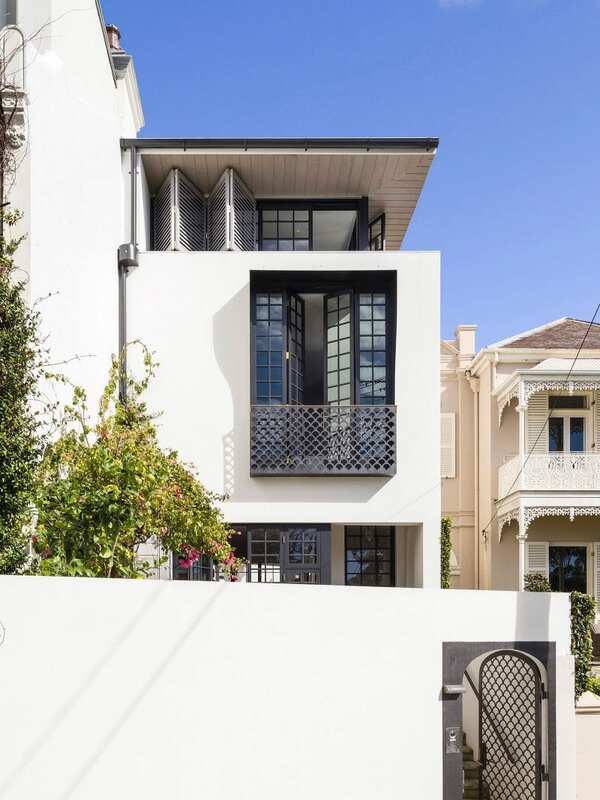 Woollahra Council was very supportive of this project and provided an unconditional approval in record time. At the centre of the courtyard, the barbeque and fireplace is the spot to gather on a summer night to roast marshmallows and redesign the world. 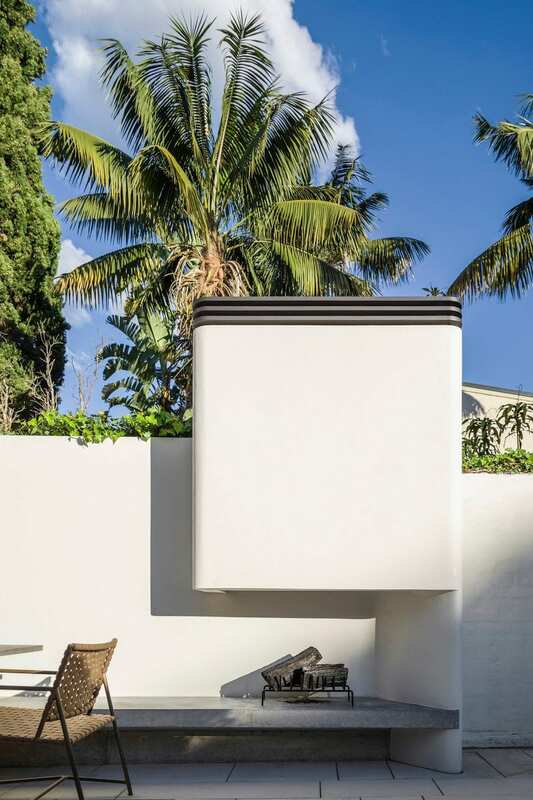 The concrete seat can be used as a sun lounge or a bench. 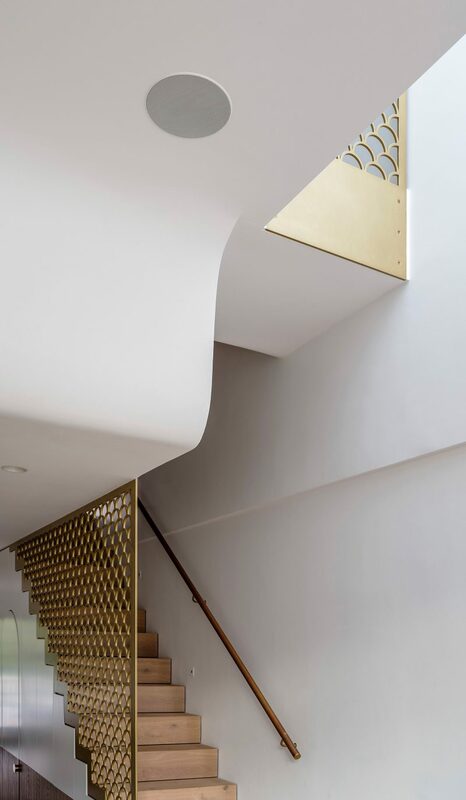 Another CNC routed aluminium panel, which continues the melodic theme of Schinkel’s fish scales adopted for the house, provides a contemporary solution to stair design that meets the building code. 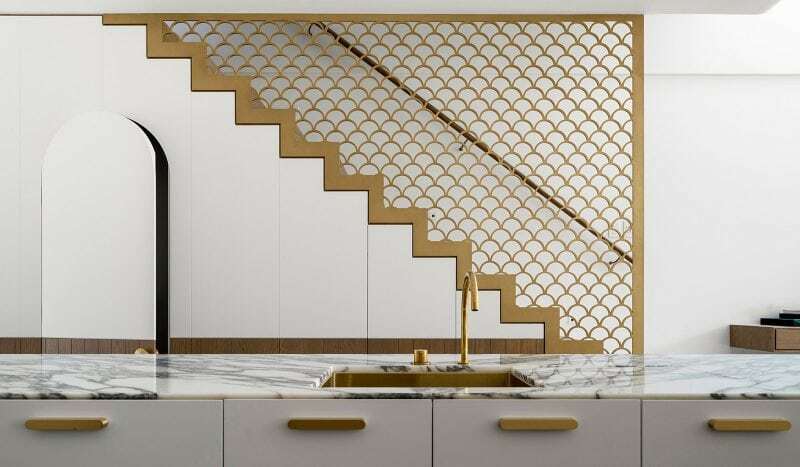 The brass kitchen tap, opposite the brass finish of the stair balustrade, are coordinated with the handles and golden kitchen sink. 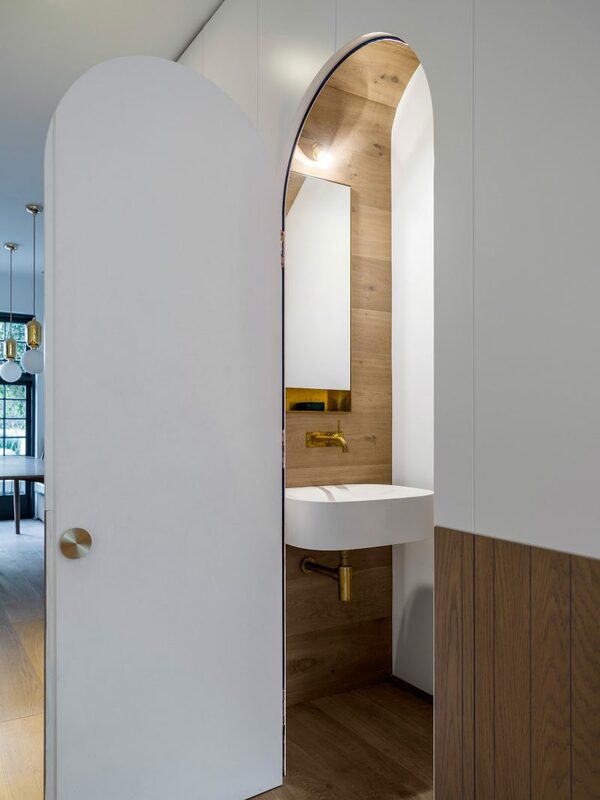 Preparing for a commission to design the new Airbus toilets, Luigi Rosselli Architects have experimented with compact design for such situations with the understairs powder room. 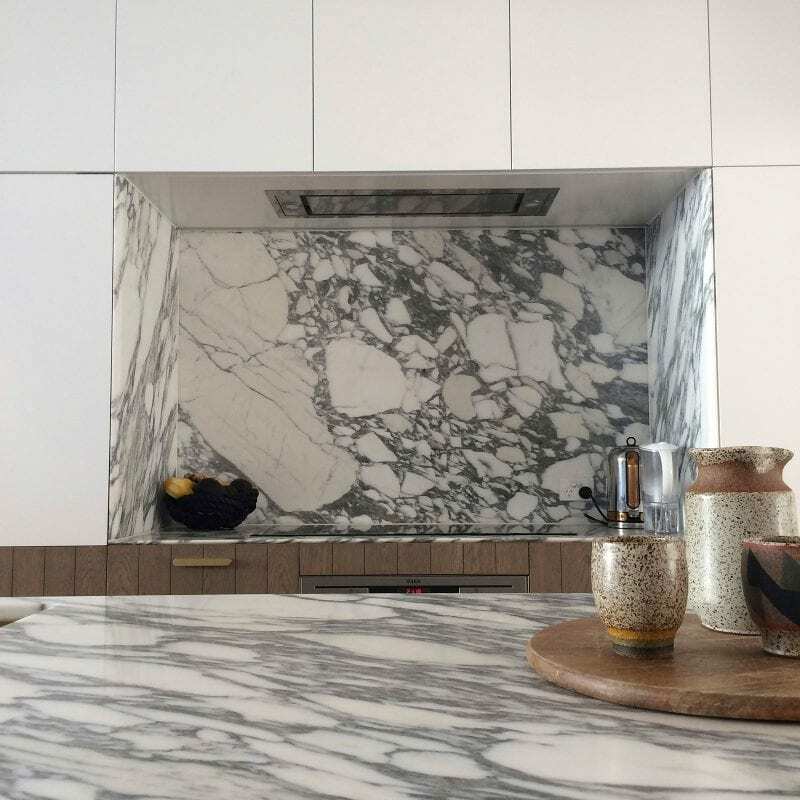 Carrara marble with a shark nose edge is an everyday reminder of the melting pack ice at the Earth’s poles. The pleasure of working in a compact terrace house is that the space restrictions in the kitchen discourage the inclusion of extra-large or multiple ovens, and the oversized fridges full of spoiling food. 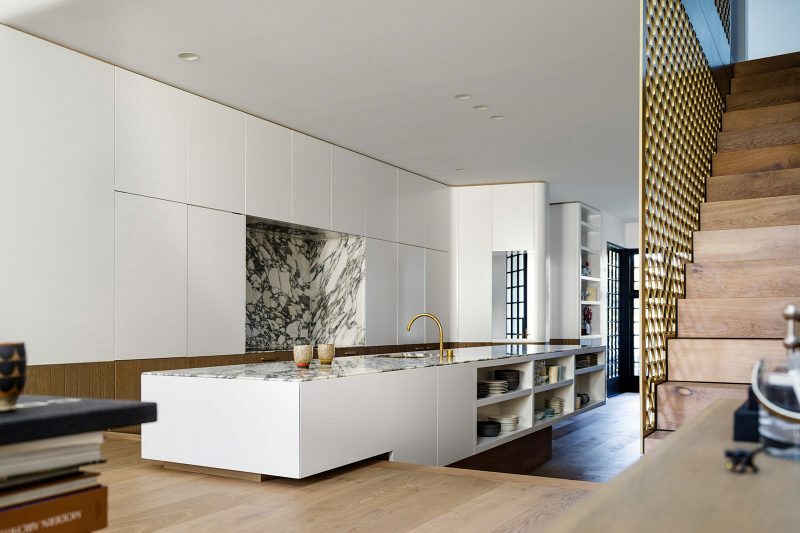 The living room is on a split level, the kitchen bench straddles across the two levels. On the far right, behind the stair there is a dining table. Hidden behind the kitchen cupboard return is the front door. 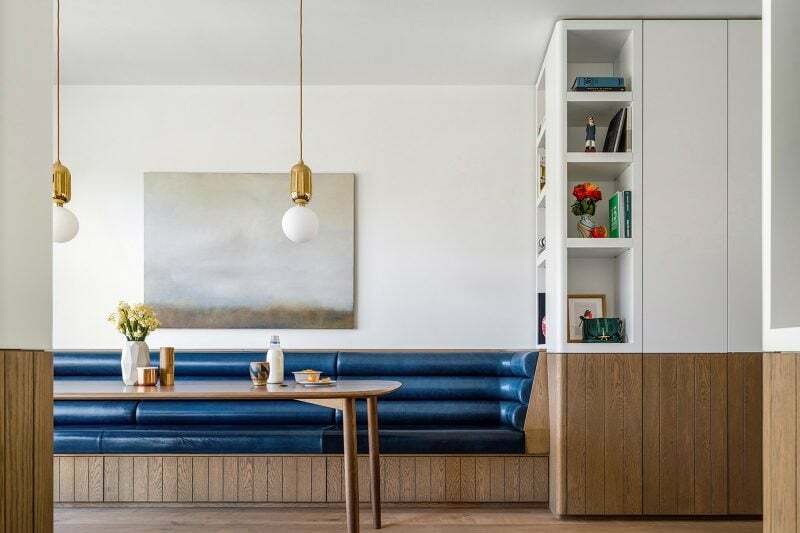 Eileen Gray inspired bench seat – The Bibendum Chair was itself a reference to the famous Michelin Man, also named Bibendum. Easy to draw but difficult to execute: the sculpting of the foam stuffing and the double curving at the ends posed a number of challenges for the upholsterer. The base of the joinery is panelled with stained American oak veneers with routed “V” grooves. Sculpted ceiling to negotiate the split level and a lightwell over the living room. The lightwell over the living room on the left allows the morning sun to bounce down to the kitchen. Fine timber windows are designed to offer multiple uses for all seasons. 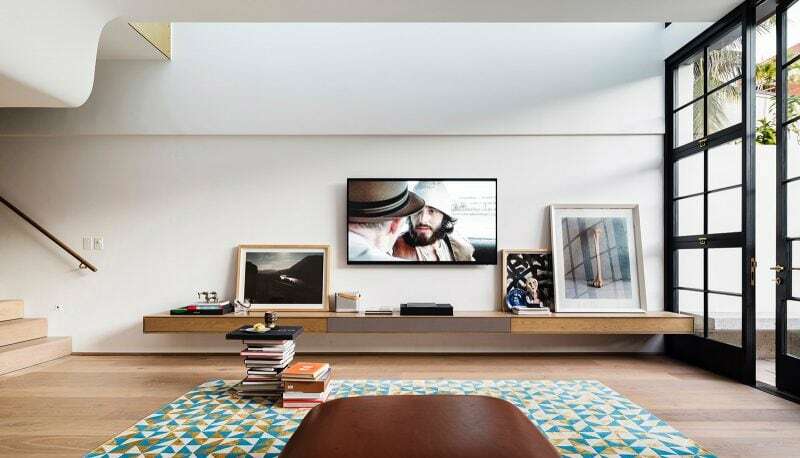 Al Pacino consecrates the Director’s living room from his black TV screen. The concrete seat from the garden continues inside at the same level, metamorphosed into a slim audio-visual unit. 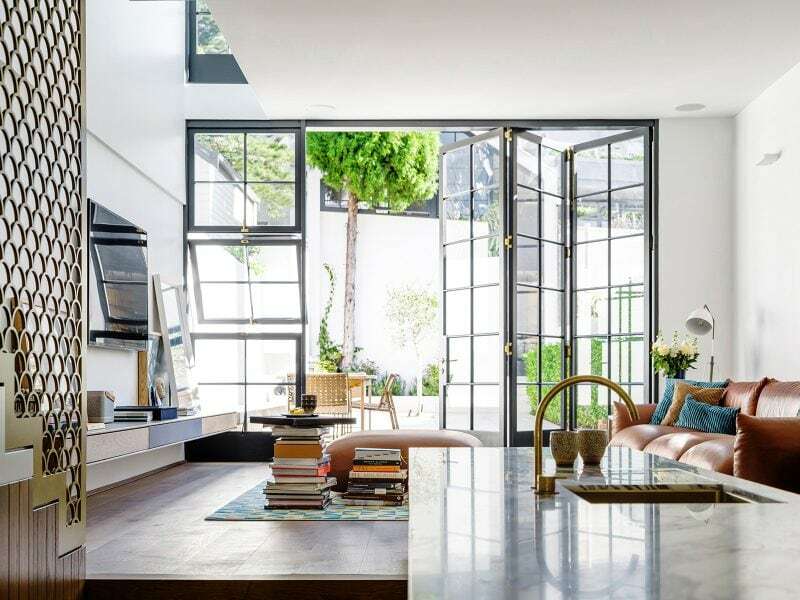 Horizontal openings offer a panorama that spans from Sydney Harbour, across the leafy hills of the Eastern Suburbs: Woollahra, Double Bay, Bellevue Hill and Bondi Junction. 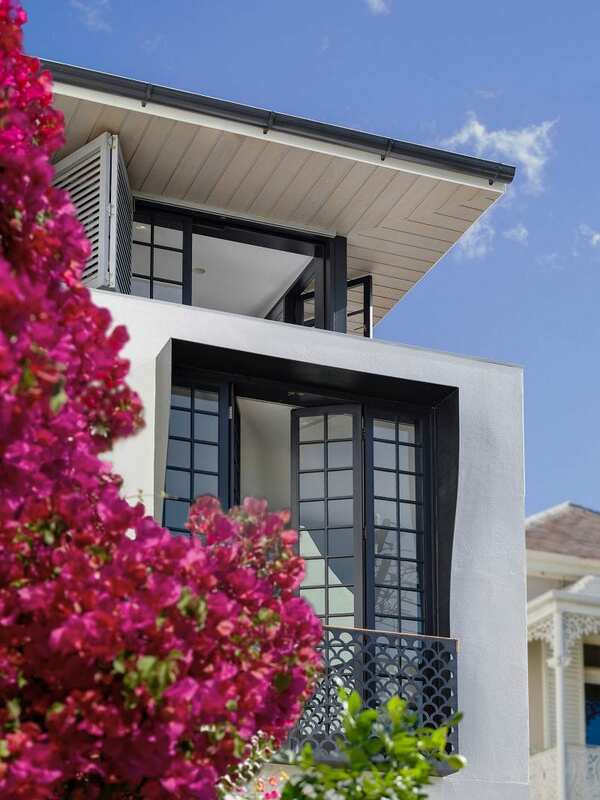 All the windows can be opened, outside shutters fold and deep eaves provide ample sun protection. The tall French doors open inwards, European style, thanks to the ceiling rising in their proximity. 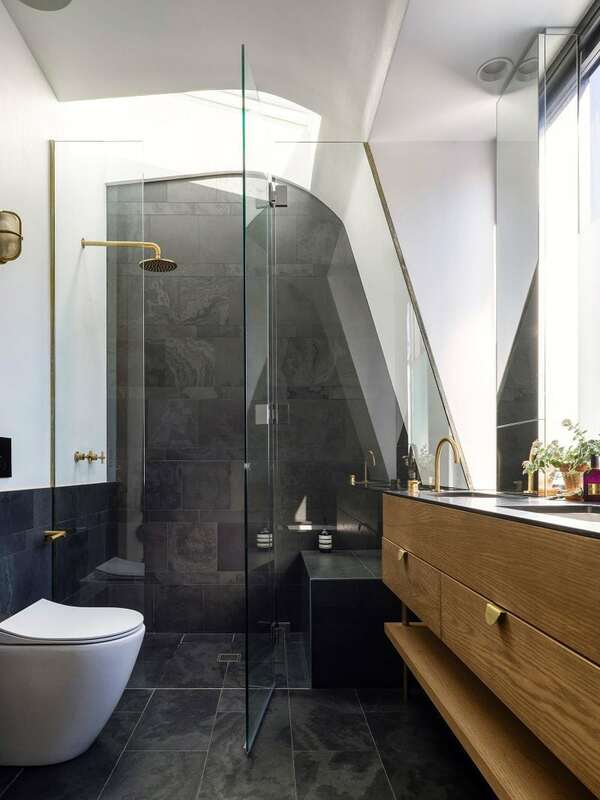 The master ensuite provides a brass shower under the stars and a toilet with a view of the clouds. The slate tiles can be used as blackboards. 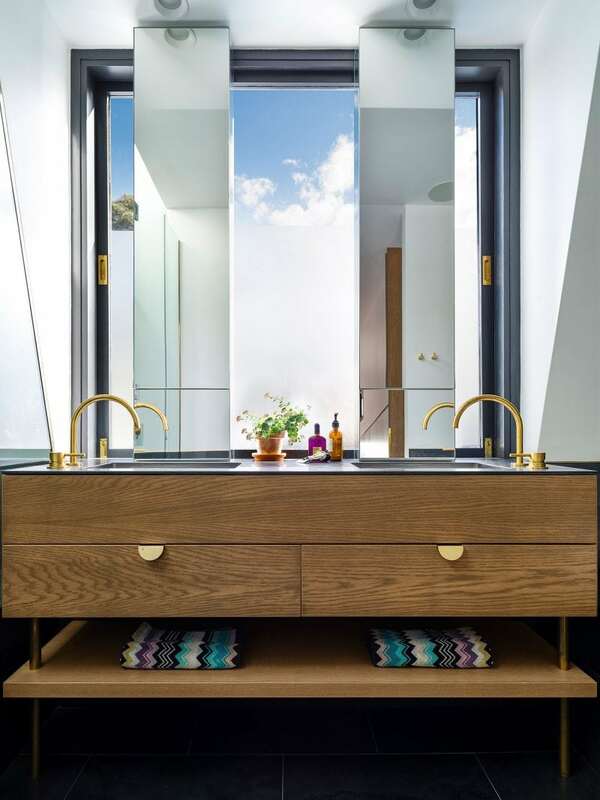 Solid American oak and brass Hafele handles are used in the vanity. Slender mirrors allow plenty of light to bathe in. 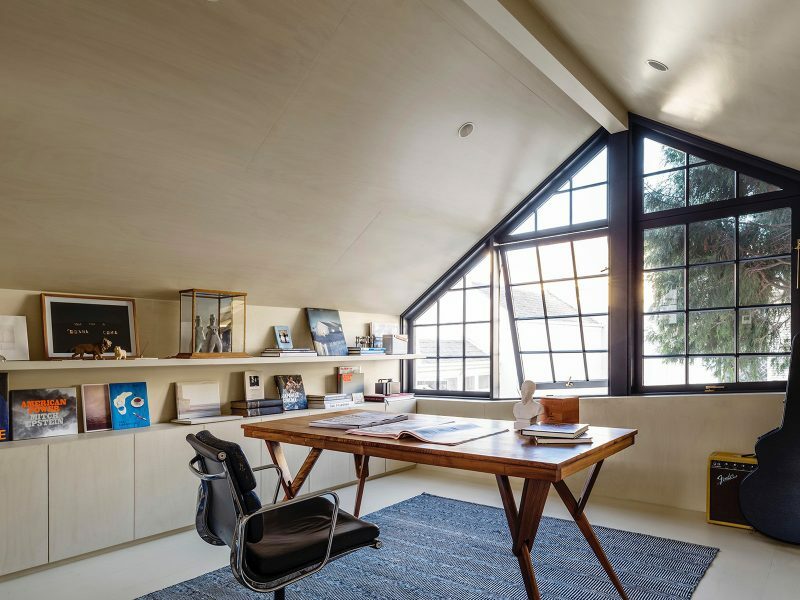 The study space over the garage is conceived as a cave for a modern man, with walls lined in limed hoop pine boards with matching bookshelf and flooring. © Copyright Luigi Rosselli Architects 2013-2018. All Rights Reserved.